I don’t know if you heard, but there was a Block Party in Capitol Hill last weekend? And the internet alternated between talking about it a lot and declaring loudly its intentions of being entirely elsewhere? The summer weather must have made dunk tank duty a whole lot more desirable. To raise money, the Vera Project sold chances to send local celebrities into a giant bucket provided your aim was good or your determination to break the rules was strong enough. Sound on the Sound pals captured some choice moments of Murder City Devils’ Spencer Moody taking a dunk for the kids [sots]. Above, Mad Rad invites pitchers; after the jump, a real live juggalo and the Stranger’s nightlife photographer Matt Hickey take the plunge. I’m so glad that the powers that be decided to schedule the Capitol Hill Block Party on Friday and Saturday (instead of Saturday/Sunday), because I needed at least a full day of brunch and mojito sorbet and air conditioned photo sorting to recover from the sweltering weekend of fun, bands, gooey folded Tribunali pizzas, afterparties, beer gardens, and races through crowds and bottlenecks to catch bits and pieces of as much of the stacked Saturday lineup as possible. The locals more than held their own against the nationals, the new layout helped a bit (though bottlenecks seem to be a fact of life for a festival set among intersections), and although I saw only three sets top-to-bottom — the Pains of Being Pure at Heart [swoon], the Thermals [awesome, now with even more amazing covers], and the Gossip [amazing, block party winners] — I heard a whole lot that’s sending me to my nearest record store this week. I also snapped far too many pictures (day one [flickr], day two [flickr]. If you don’t have time to wade through the photosets, snaps of most of the bands I caught are curated after the jump. More coherent ramblings later, I’m sure, but for now a batch of pictures from a somewhat lazy day at the Capitol Hill Block Party, as the mercury rose so did the thickness of the crowd converging on Pike Street, especially for mainstagers Deerhunter (a few technical difficulties), Built to Spill (jamming into the sunset), and Jesus Lizard (rocking away after 13 years). Inside, Sleepy Eyes of Death killed it with noise and lights. And on the Vera Stage, Micachu and the Shapes made for enthusiastic afternoon listening, kids went justifiably wild for Starfucker (toppling fences and nearly tipping speakers), and Mika Miko closed the stage with a bang. The night ended with a massive dance party at Neumo’s hosted by Sing Sing. Today looks even sunnier, warmer, and with an even more action-packed line-up. The doors are open and the music starts at two. The popsicles from the Washington Bus are definitely worth the pop quiz, too. See you there! capitol hill block party; scene from last year, photo by me. [flickr]. Lucky us! This weekend is looking sunny, precipitation-free, and we have a big music festival called the Capitol Hill Block Party commandeering one of our city’s best few intersections. What better way to spend a weekend than melting on the surface of the pavement-covered sun while listening to a great mix of local and national bands? To cope with the climate, keep an eye out for free popsicles from the Washington Bus, dunk tanks featuring music personalities, creamsicles, mainstage water canons [wtf? ], and innovative new ice cream flavors. There are two ways to get into the block party. If you already have a ticket that you’re able to hold in your eager little paws, then you can can slide in on Pine & 10th Avenue by passing through the culinary temptations of Rancho Bravo and Molly Moon (their mojito sorbet, btw, just might save your life when the temperature spikes). The rest of you, ticket buyers, will callers, and guestlisted will go to the main entrance on 12th Avenue and Pike Street. Tickets haven’t sold out yet, but buy in advance, arrive early, or face a sold-out event and fall upon the mercy of scalpers and spareholders. Daily tickets cost $23 and a two-day pass goes for $42. You can get them at the doors, online, or at Urban Outfitters (where you’ll only be charged a $1 service fee) If you’re under 21, be aware in advance that 1/3 of the acts will inaccessible to your underage ears because the Neumo’s stage is 21+. But, hey, two out of three isn’t half bad. Once you’re inside, you can enter and exit as long as you keep your ticket stub and get your hand stamped on the way out. Good to know if you’re feeling overwhelmed by the teeming mess of humanity, need to lounge in the park, require a caffeinated pick-me-up, or feel the need to slip away for food and drinks not served on plastic. Let’s be honest here and say that you’d be a fool not to consult the Stranger’s guide. They’re presenting the Block Party and have prepped a tabloid book to tell you all about all of the bands in generally glowing terms. [thestranger] Cross-reference that with the official lineup [chbp] and choose wisely or wander aimlessly. If you love spreadsheets, I put the whole thing into a Google Document [xls] for your organizational delight. Instead, then, a brief overview of the three categories of bands I’m planning to see this weekend. First, are those that I’m spine-tinglingly thrilled to be seeing very soon even though the heat might kill me (it won’t, I made it through Coachella with nary a fainting spell, but you know how pre-complaining about beautifu weather is an essential talisman in these parts.). On Friday, the top of this list is Deerhunter , mainly because I can’t figure out exactly where Bradford Cox is taking the band but I can’t wait to find out and see how it all works live. On Saturday, I’m nearly sick with anticipation for the Pains of Being Pure at Heart , (whose Song of the Spring “Young Adult Friction” has bled over into a Son of the Summer and threatens to stick around well into Autumn) though I worry slightly that they’re so fuzzy and introverted that they’ll melt into puddles when faced with the late afternoon sun. I have no such concerns for Gossip and the Thermals , both of whom seem to exist for the sole purpose of causing you to overheat in different ways. If you’re not having a good time while they’re playing, you must be doing something wrong. In London this spring, it was difficult to find a time of day or magazine rack not celebrating either Kings of Leon or [the] Gossip, their appreciation for the southern-tinged rock scene somehow less unabashed than our own. I haven’t seen them for a few years, but their latest album leans a bit more into pop territory with an energy that never lets up. As for the Thermals, I have yet to leave one of their shows not feeling exhausted, elated, maybe slightly bruised, and carrying a bit of sweat from my neighbors. Both groups make political music where the politics never gets in the way. Seeing them back-to-back might kill you in the best way possible. Next are the near mandatory mainstage closers. Here, I admit that I’m embarrassingly unexcited about the Jesus Lizard and Sonic Youth. Obviously, these are strong headliners and I take my own under-enthusiasm as personal musical failings and a source of dull nagging shame. During the howling scrotum-baring height of the Jesus Lizard’s reign, I was too young and/or too saturated by mass market commercial radio to even know of their existence, leaving me unable to even conjure an idea of one of their songs from memory. For Saturday’s stars, I’ve always wondered if Sonic Youth missed their chance to get fantastically wealthy by not breaking up briefly instead of working hard, building a career over thirty years, and putting out record after record instead of following the Pixies model of dramatically self-destructing until the clamor for a reunion was so great that they were able to spin a few one-offs into a seeming never-ending arena tour followed by a Doolittle revival. Anyway, I’m planning to take the closing hours of the Block Party’s mainstage as a way to polish some of the tarnish from my music landscape. Finally, the best part of a festival setting are the vast possibilities for discovering your new favorite bands. On this note, I’m most looking forward to this weekend as a remedy to having missed too often so many of the bands that I’ve heard millions of glowing buzz. At the top of this category on the local side are Hey Marseilles , the Moondoggies , the Maldives , the Pica Beats, and New Faces (all Saturday). On the national side, my curiosity about Micachu & the Shapes is peaking thanks to their clangy and noisy and just so oddly compelling album; Starfucker have such a good band name that they require at least a few songs of attention (both Friday); as do apparently croony rockers Edward Sharpe and the Magnetic Zeros and screamy emos Japandroids. That said, suggestions for other overlooked unmissables are gladly considered. As if the official lineup isn’t enough, the Comet and the Cha Cha are both hosting their own slates of live music, too. Both bars are inside the grounds; so your ticket gets you in to these for free where you can get drinks away from the gloating sun’s ruthless glare. The Cha Cha has the Get Off (5:45); Toy Soldiers (6:45), Fun Fun Fun (7:45), Loving Thunder (8:45), & Born Anchors (9:45) on FRIDAY and the Absolute Monarchs (3:45), Spinning Wheels (4:45), Thorstone (5:45), Moonrats (6:45), Champagne Champagne (7:45), Constant Lovers (8:45), and Book of Black Earth (9:45) on SATURDAY. The Comet has the Oswald Effect and the Girls starting at 11 on Friday. (NOTE that “Girls” play the mainstage on Saturday and are a different band from “The Girls” playing on Friday, neither of which have any female members. Both of these bands being in town nearly compels a Girl-Off of some sort). On Saturday at 11 you’ll find Hallways, The Curious Mystery. If by some feat of superhuman strength you aren’t dead from exhaustion on Saturday night there are afterparties to attend. The biggest one being at Chop Suey, where Mad Rad, Macklemore, DJs Darwin & Recess, and Whiskey Whiskey start their quest to leave you a bubbling pile of happy goo at 9 pm. Advance tickets cost $5, and a block party bracelet at the door gets you in for $3. That is, if they aren’t already at spectacle-craving capacity by that point. With that, some parting advice: wear sunscreen, be nice to your neighbors, eat something fried or on a stick, see a bunch of music, and have fun! If you see something great, snap a picture and send it to our photopool [flickr]. Find your way to a rooftop or VIP party and send us the password! See you there. help doug plan his chbp setlist. 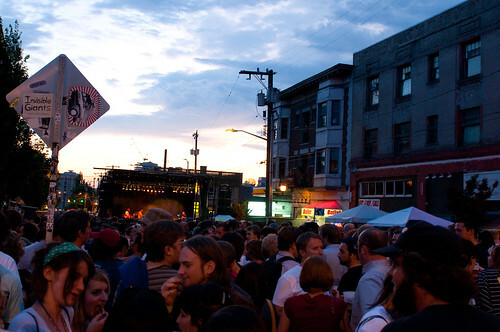 Next weekend, the Capitol Hill Block Party takes over Pike Street from Broadway to Twelfth Avenue. The layout has been reconfigured [lineout], with the main entrance moving to 12th Avenue and the mainstage moving closer to Broadway to try to offset some of the crushing human traffic that resulted from people trying to pass through the ticket gate and traverse last year’s Mainstage/Neumo’s/King Cobra (RIP)/Beer Garden intersection of doom. Built to Spill, playing on the mainstage on Friday night just after Deerhunter and before the Jesus Lizard, are leaving their set list in your trusty hands. You have until tomorrow to let them know which of the songs in their lengthy catalog you just can’t live without. Vote online at KEXP and they’ll crunch the numbers to come up with something really special for your sunset listening. The lineup is pretty spectacular [chbp] — in addition to all the locals you’ll also find Sonic Youth! the Gossip! The Pains of Being Pure at Heart (at last!) and many many more. Tickets, which are still available, will run you a reasonable $23 per day; save a few bucks and buy a two-day pass for $42. You’ll find them online [ticketswest], at Rudy’s, Moe Bar, or with a mere $1 service charge at your neighborhood Urban Outfitters. They’re apparently selling fewer tickets this time around to limit the crowds; so get your tickets early. And if you have spare invites to your VIP rooftop patio, invitations are gladly accepted. robin pecknold, of fleet foxes, at the capitol hill block party. You, wonderful you, enjoying Chromeo on the main stage. Photo by joshc [flickr]. Last year’s Capitol Hill Block Party made for one of the best weekends of music I’ve ever had (Daft Punk’s Sunday night finale at WaMu Theater definitely helped). This year’s Block Party had a lot to live up to – probably too much. But you know what? I enjoyed it nearly as much as I did last year. The Block Party moniker is apt – it really feels like a big neighborhood party. I bumped into old friends at almost every stage and by the end of Saturday night had made up my mind that I’d take a Capitol Hill Block Party over a Bumbershoot or Sasquatch any day. After the jump, some thoughts on a couple of the weekend’s sets and my favorite photos from Josh’s Flickr collection. Block Party, this may be a little indelicate, but we need to talk about your size. See, it seems that you’ve grown out of those pants you’re wearing, and it’s making you really difficult to be around. While it’s nice to have the mainstage in the middle and all, it makes it ridiculously difficult to get from one side to the other. I spent most of the weekend pretty stationary mostly because I was afraid of getting sucked into the crowd. If you keep this up, people are going to get hurt. The best dance party of the weekend came, unsurprisingly, during The Saturday Knights’ appearance as the super secret Neumos guest. (Told you so.) I feel like I’ve been practicing tantric record appreciation for the last few years, waiting for these guys to finally release something other than the EP I’ve had since they were giving them away at the Crocodile in 2005, and I’m so pleased that Mingle was the album I was hoping for. Most of the crowd in Neumos around us clearly were not Metroblogging readers, because they had no idea who was coming up, and when The Saturday Knights walked on with a full band and started in on “45” the crowd sat in stunned silence for a second and then let loose. By the end of the set I was drenched in sweat and beaming, without once having been trampled to death by the crowd. craig finn of the hold steady at the capitol hill block party on saturday. more in the photoset [flickr].